Can be customized to suit, including font and color. Enter your wording, quantity, color, and paper choices in your order. You will have an opportunity to order matching inserts at this point. Please enter any special requests in the box provided. You will receive a PDF proof within 2 business days of your order. Tell us your thoughts and any changes. 2 Free proofs are included with your order. Your designer is available to make adjustments and answer any questions during the proofing phase. Once you are happy with the proof, your digital signature is our green light to send to print! Wait 2-4 weeks, depending on printing process, for your finished paper products to arrive via FedEx. They will arrive unassembled. We will provide a tracking number upon ship date. Please see our shipping policies for more details on this process. To ensure an optimal customization experience, please visit our website on a desktop computer. Enjoy! Invented in the 1400's, this printing method is our most requested. 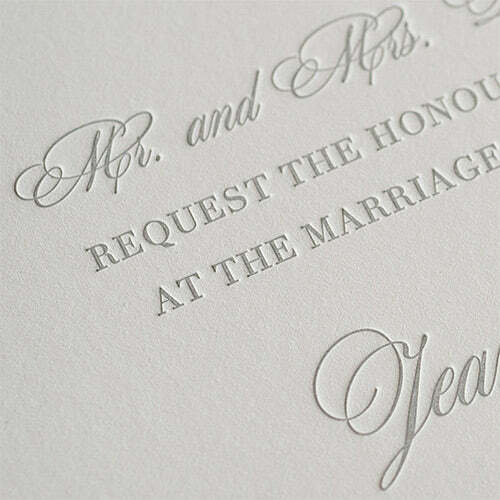 A plate is made in relief of your invitation, inked and pressed into the paper, creating a deboss you can see and feel. 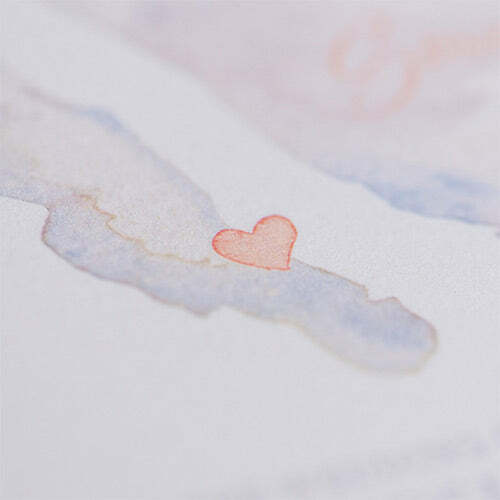 Inconsistencies in the ink coverage can occur and contribute to its hand done appeal. A real sheet of foil is placed between press and paper. 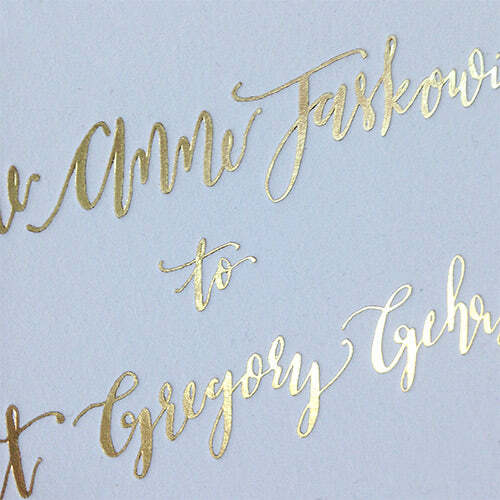 Heat and pressure transfer the foil to the paper, creating a debossed shimmer-y surface. Foil is available in gold, silver, copper, and rose gold. Feel free to enter a special request for a different or matte color when placing your foil order. We'd love to customize your design even further! Offset Lithography- A rubber press transfers ink to paper, creating a clean, crisp outcome. Good for all over areas of color. Digital- Digital delivers the clean printing of offset and is used to achieve our watercolor method of printing, as it allows for multiple colors to be printed at once. Your completed invitation set will ship 2-4 weeks after proof approval via Fed Ex ground with signature required, unless other arrangements are requested. We will provide a tracking number upon ship date. Please see our shipping policies for more details on this process.